Susan and Kitty are shining the Bat-signal on one of Gotham’s smartest heroes. No matter the challenge, she uses her intellect to escape danger, help other heroes, and reconcile with her own past – It’s Barbara Gordon- Batgirl Then & Now! This week, we’re shining the Bat-signal on one of Gotham City’s most intelligent residents- Barbara Gordon! From running with the Bat-family as Batgirl to soaring with the Birds of Prey as Oracle, this formidable fighter uses both her physical strengths and superior intellect to keep track of crime, help other heroes, and deal with the dangers of her past. When discussing Batgirl and how she’s evolved, you can’t forget the iconic modern “Batgirl of Burnside” designed by artist Babs Tarr, written by Brendan Fletcher and Cameron Stewart. 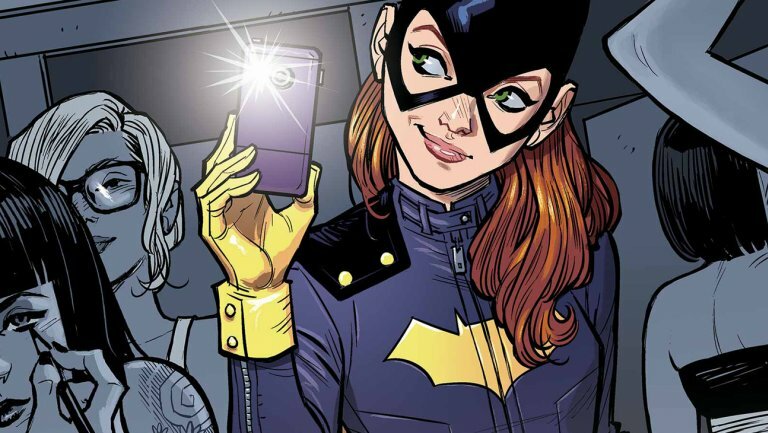 This most popular modern Batgirl captures a fun and breezy side of Barbara Gordon as she moves to the hip Gotham suburb of Burnside to take on foes new and old. Batgirl of Burnside is most recognized by her purple moto-jacket, Doc Martens boots, rounded cowl, and black and yellow cape. Also referred to as the “selfie Batgirl” she captures the modern sensibility of this hero like never before. As Oracle, Barbara Gordon was able to leverage information about nearly all of Gotham and aid heroes in action in a new way. Traumatized and left paralyzed by a gunshot wound from The Joker, she didn’t give up her desire to help stop crime wherever it arose. As the “woman in the chair” for notable heroes like Batman and the Birds of Prey, Oracle became the mind behind some truly amazing heroic victories, putting mind over matter to help save the day. Even the brightest intellects can be met with overwhelming obstacles- Barbara Gordon has proved that when she puts her mind to it, she can overcome anything in her way. Whether it’s a physical foe or a mental challenge, Batgirl has the smarts and skills to stop her enemies, aid her allies, and most importantly, help herself to stop the injustices in Gotham City and beyond. You can check out the full Then & Now podcast on iTunes, or subscribe to our Youtube channel. You can also find our channel hosted on Pippa at side.show/thennow. Keep an eye out for new episodes and more ways to listen coming soon. If you like the show, be sure to subscribe and leave a 5-star review so that other fans can find the podcast! What other characters, films, or events would you like to see covered in upcoming episodes? Let Your Geek Sideshow and tell us in the comments! CW Reveals First Look at Jon Cryer as Lex Luthor, Netflix Premieres Umbrella Academy Official Trailer, and More! Netflix Announces She-Ra Season 2 Premiere, New Riverdale Spinoff On Its Way, and More!